I have known Dave Jordan for several years now. He is a brilliant and empathetic man. We have much in common. He is the founder and CEO of Valentus. I was once a distributor when they launched. I terminated that distributorship for several reasons. I was poorly matched to my sponsor. He was simply unprofessional and I exercised the 6 month rule and terminated my position with plans to return after 6 months to seek a better sponsor. The CEO of the company and I see eye to eye regarding customer centricity and what a customer centric MLM company should look like. See my most recent article in this regard @ https://markethive.com/group/marketingdept/blog/customer-centric-model a Markethive Blog. With that said it was clear it would take time for Valentus to shift into a more concentric model and even more so, to actually become a customer centric system so this also affirmed my terminating from the company, until such time I felt they actually deserved my recognition for pushing forward into “customer centricity”. A product that has demand and 80% reorder rate. But even more telling, is this product sells at auction on Ebay (backed up by historical search) a selling point about 25% above the cost point. This is un heard of in MLM.This is a product that the demand is growing and the selling point increase backs up. Valentus delivers a portfolio of pages. Some are only for retail, another is a lead taproot system. Others are for recruiting distributors. So, there are Leads pages, Customer acquisition pages (retail sale), and distributor acquisition pages. Further noted, all pages are responsive too. There is the ability to drop ship samples to prospects automatically from the back office dashboard. This one feature alone, saves the distributor time, frustration and money. Virtual inventory (much sooner than you think too), therefore allowing the distributor to keep inventory ready for drop shipping at the company warehouse, to accommodate online selling, on our own pages, Ebay, Amazon, Alibaba. Olx, Kajijij, etc. Self-replicated Amazon stores, were we as distributors, have the option to automatically have an Amazon store, were, Valentus collects the money, sets the price threshold and ships the product. But they are our stores, were we manage them, promote them and add other inventory as we wish. 800 telemarketing service platform: Today’s technologies not only make this proposed service affordable, but extremely effective. Typically, new distributors are assigned an ID# number. The number resides within the servers database to track sales, commissions, etc. of the distributor. Thus the hardest part is already done for an 800 sales number. [A little explanation of current tech] 800 number technology software interfaces display the originating number, or forwarded number. IE: If the distributor develops a radio commercial with a phone number (toll free or not) then forwards that number to the company 800 number, all he or she needs to do is register that number (via the back office) or calling it in. This way the telemarking operators receiving the incoming calls, or the technology, know who originated the call and the orders are taken and assigned appropriately to the distributor. Imagine the projected results with the distributors taking the initiative, no more need for mentors, no more need for charming leadership, no more need for motivational events, because the motivation is found in the system and the results. Imagine! Customer and Lead co-op acquisition: This is where the company marketing people run ads, driving vertically targeted prospects to an 800 number or website, acquiring quality pre enrolled prospects or customers who have purchased or best have enrolled into auto ship. The distributor’s contribution enhances the company’s budget and the “partnership” enhances the customer’s retention. The company also makes available to the distributor mailing lists to their “enrolled leads and customers” to assist in the continued purchases etc. It is a win win situation and is a proven technique as proven by Trivita. API (Application Programming Interface): Distributor selling on Amazon, Ebay, Alibaba, etc. Basically, the MLM company has an API developed that interfaces with Amazon, Ebay, etc for the distributor. This allows the distributor to develop an online store on Ebay, Amazon, Alibaba, etc, drive and support the prospects and customers, but the sale interfaces through the company. Thereby the company controls the pricing, collects the money (connected to the distributor) and ships the product. All the collecting, shipping, tracking and commissions paid out is done by the company. API: In computer programming, an application programming interface (API) is a set of routines, protocols, and tools for building software applications. An API expresses a software component in terms of its operations, inputs, outputs, and underlying types. Social Marketing Aps and systems: Marketers, merchants, etc. need a portfolio of tools, to get the message out, to build awareness, to build a sphere of influence and to build a customer and distributor centered loyalty program. Very few people, even entrepreneurs have all the skill sets to achieve this. However, automated marketing, email auto responders, social broadcasters, coop advertising, blogging platforms, materials and videos are necessary tools for the entrepreneur. When you do not supply these types of tools in a controlled environment, the message being broadcasted may not meet the criteria of the company nor abide by regulations. There are solutions and Markethive is one of the best options. Markethive supplies all of these tools and more, integrated and easily configured and controlled within the communities vertical structures built for DSA companies like yours. It is called the company Directories and within a company portal in Markethive, your distributors will find all they need; Broadcasting platforms, self-replicating personalized PDF documents, Coop advertising systems, blogging platforms, email auto responders, everything needed for marketing, in one place. Momentum is a mystery to most Network Marketers but it’s also the most talked-about and influential subject in MLM. It is also maddening. I mean both in a fantastic and exciting way. Embracing the possibility of ‘getting in before momentum’ is a miraculous thing if you want to build a huge business in the shortest period of time. When momentum is happening, recruitment and sales accelerate in ways that make you scratch your head. Fast Pace becomes SILLY Fast Pace. So many people join your team that you can’t keep up with training everyone. In the middle of it, as things get fun, each time you check your genealogy report and expect to see it up a few hundred people, it multiplied to thousands and suddenly your heart beat gets faster and faster. People look at you and you seem to walk on clouds. If you believe in the power of momentum, you will sound like a ‘loon’ in discussions about your company’s growth so keep it to yourself. The goal of this blog post, is to bring the most maddening and sometimes mysterious concept of momentum to the forefront. Companies going into momentum are not ‘sure things’ going forward, but as I have long believed, momentum moments can be captured by a few lucky network marketers. I can’t be there to tell you when that happens, because no one told me. But it is a lifestyle altering scenario that can make sense for some. When there is no momentum, we are extremely vulnerable to distraction and defeat. Our inner critic awakens, and we start second-guessing ourselves, doubting the possibility of success. Other people’s demands creep in, asking for our attention and focus. We start to look at new projects or ideas that seem even more worthy of execution, tempting us to move onto the next big thing without ever finishing. 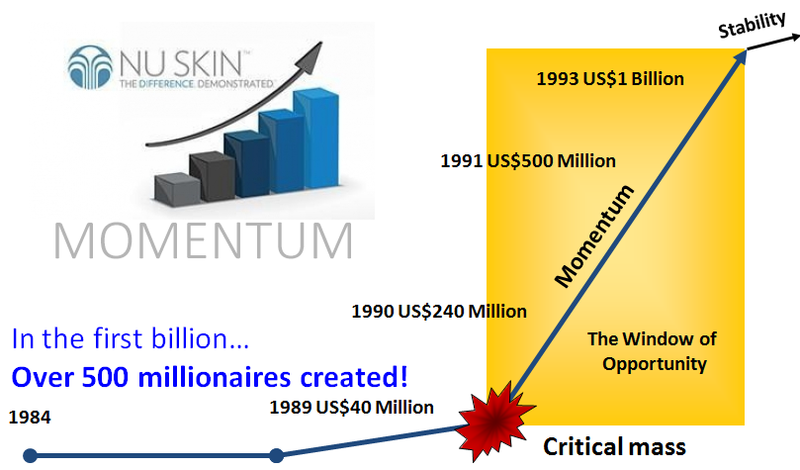 And what you see on the graph below is the growth cycle of Nu Skin starting in 1984. As you can see in 1989, this company went from $40 Million in 1989 to $5oo Million in 1991, all the way to $1 Billion in 1993. 500 Millionaires were created in this company during that time. Some people kept pace with that company during that explosive growth and saw their income skyrocket within a very short period of time. According to Richard Poe, author of Wave 3: The New Era in Network Marketing, there are four distinct growth phases that typically occur in successful network marketing companies. Knowing these phases and knowing what phase your prospect company is in is key to potential big money. Formulation: This is the first two years when start-up is happening.Ninety percent of network marketing companies fail during this period. Concentration: At this stage the company enjoys $3-$50 million in annual sales.This is the “growing pains” stage, when the company has to adapt to rapid growth and change in order to service its swelling customer base and sales force. 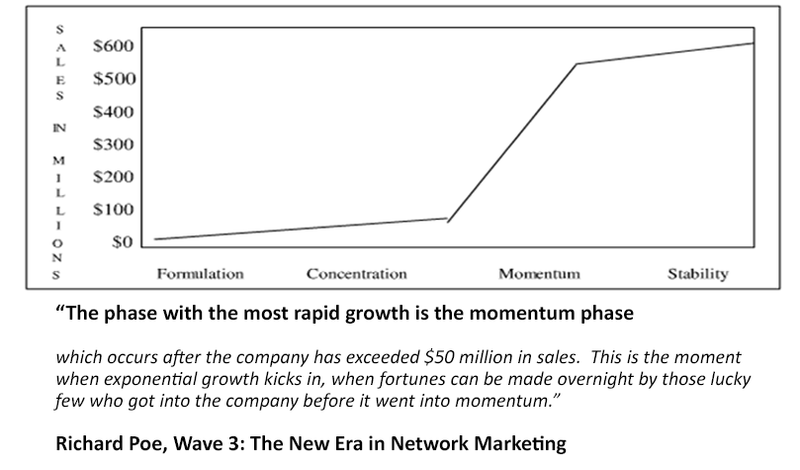 Momentum: This is when the company’s annual sales explode as geometric growth kicks in.Typically, sales jump from about $50 million to $500 million annually in about five years.At this stage, the product becomes a household word, sales people rush to join the company and make very good money.Those who were fully established in the company at the onset of the momentum can make fortunes overnight. Stability: Now the company continues to grow, though less spectacularly.The product line is often diversified to try to create a new wave of momentum. Other Criteria: It is also important to determine if you have a growing high quality product line (especially consumables) and you may have winner.Finally look at the Founders and other backers and determine if they have a good success record and they can bring wide exposure to the business. As of this writing, Valentus is breaking all sales records throughout the industry. Unlike like most MLM companies, Valentus has taken 2 years to reach $40 million in sales. But what’s important is that $40 million needs to be produced in one market to enter into momentum. Valentus is headed to do over $40 million worldwide in the second year of business. 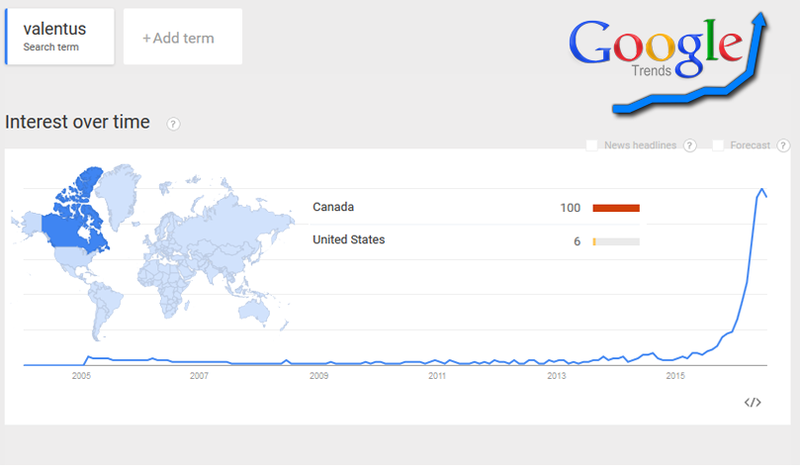 This is where critical mass will push us into momentum and people will hear about Valentus from everywhere. How many millionaires will be created when Valentus enters into momentum? I personally don’t think it’s a question of how many it’s going to be, but WHO are they going to be? Because it’s going to happen and we’re poised for this right now. In this early stage of creating momentum it is extremely important to overcome any barriers that come your way. As momentum increases, this will become easier but in the early stages it may take a focused effort if problems come your way. A train moving at full speed will smash right through a brick wall and keep moving; however a single rock placed properly can prevent a stopped train from getting started. So in the early stages of creating momentum, if problems or obstacles occur, do whatever it takes to get past them and move forward. That same problem will become easier as you see more and more success. Markethive is a startup company, however, in a class of itself, because of its legacy. Markethive is the results of a previous company called Veretekk (A company I also owned that invented Inbound Marketing in the mid 90s), which gives us over 20 years of intensive development, and experience. In this process we have had to raise investment capital and crowd funding by hook and crook so to speak. The Alpha Founder program was one such promotion. I offered to practically give it all away in return for your small assistance to get us through another month of development, polishing and preparation of our eventual official launch. Now we stand to build a sustainable income utilizing the power of Markethive with a viable customer centric business. I also have substantial venture capital offers and notable recognition and the Alpha Legacy offer now stands to actually diminish our move forward. Although the Alpha Founder offer was a great offer for you, most people either ignored it, or never understood the value that offer represented. You see, Markethive stands to become another Unicorn tech company. Similar in tech companies like Pardot (Another Inbound Marketing Platform) very similar to Markethive just sold for 95 million and they are not energized with the Social Networking aspect we are. Other investors and industry leaders are beginning to recognize Markethive as an industry leader and the odds that we become a billion dollar venture have improved substantially. Therefore I am officially closing the Alpha Legacy offer at the end of this month. If you want to acquire one or additional Alpha Legacies, you have until the end of the month, then it is over. Stay tuned because the land beneath us is shifting. And opportunity is looming.